It's that time of year again. Americans are making their New Year's resolutions and according to experts, nearly 85% of these will never happen. What's on the list? What are the most popular New Year's resolutions? Tops is weight loss; next are finding ways to manage money or create more free time for family, friends and leisure. Can technology help or just get in the way? Well, that depends on which technology. ... a unique community where you can dream big, take risks, overcome obstacles, find resources and achieve success! And $50 in WITI bucks to use for Membership or Teleclasses. All this is available to WITI members for just $149.00/year. (That's less than $13/month!) Not a WITI member? You can still join WITI Dream Circles for $250 and receive a one year membership with WITI. Register today! Don't wait! Invest in yourself. Invest in your dreams! Are you practically guaranteed to gain weight during the holidays, or to eat the wrong things? It doesn't have to be that way. What are some simple ways to eat right during the holidays and not gain weight? Already an active WITI Member? Please visit the Member's Area. There is a new Article Library, more free videos from our 2004 National Conference, access to discounts and the Members Directory. Also, publication opportunities for your articles on WITI's website... Share your knowledge! Often, senior corporate positions are associated with stress and lack of time for oneself, one's peers and one's family. However, if someone has the capability to rise to the top professionally, then she also can become emotionally and socially intelligent. All she needs is a little coaching. A leadership coach and corporate consultant herself, Susan J. Bethanis has written an intimate story of a semi-fictional leader's evolution into a corporate sage. Bethanis takes the reader through an engaging series of coaching sessions, allowing the reader to "eavesdrop" and witness the transformation of Max Sinclair from an over-worked, speedy and demanding executive into a triumphant visionary. As a Mortage Consultant, Michelle Jaeger Jones is dedicated to bringing the "American Dream" of home ownership to any and all, even those who have less than perfect credit histories. The mortgage brokerage helps to eliminate consumers' arduous and frustrating tasks of shopping for the right mortgage loans and lenders. Michelle's prior corporate experience has provided her clients with stress-free and quality interplay with loan resources, enabling her to find the perfect loan. 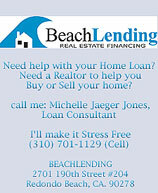 In addition to finding the right lender, another advantage with using Michelle at Beachlending as your mortgage broker includes all the time saved for you, the client. From filling out the necessary paperwork, to doing the search for the lender, she will be in charge of all the leg work. People with excellent credit often utilize Michelle's services knowing they are not only saving time, but getting the best possible loan! WITI extends extra special thanks to EMC and Oracle for their support of WITI and our 2004 Holiday Networking Parties! EMC Corporation is the world leader in products, services, and solutions for information storage and management. We help customers of all sizes manage their growing information - from the time of its creation to its archival and eventual disposal - through information lifecycle management. EMC information infrastructure solutions are the foundation of this mission. An EMC information infrastructure unifies networked storage technologies, storage platforms, software, and services to help organizations better and more cost-effectively manage, protect, and share information. Our vision is to create the ultimate information lifecycle management company, to help our customers get the maximum value from their information at the lowest total cost, at every point in the information lifecycle. Oracle's business is information - how to manage it, use it, share it, protect it. For nearly three decades, Oracle, the world's largest enterprise software company, has provided the software and services that let organizations get the most up-to-date and accurate information from their business systems. Oracle is a proud sponsor of the WITI conference. We support the empowerment women through technology. Thank you WITI for helping provide tools and experiences to help women move forward in their careers. 15% off Flowers, Gift Baskets, and hundreds of other products from 1-800-Flowers! WITI just struck a deal with leader in flowers to offer WITI Strategist subscribers a significant discount on all purchases. Be sure to consider this for the holidays; it's a great last-minute gift! 1-800-Flowers offers more than flowers, including a wide range of gift baskets. This offer includes two great guarantees, a 100% customer satisfaction guarantee and a seven day freshness guarantee. And this offer's good until the end of 2005! Simply shop at www.1800FLOWERS.com and enter code "WITI" under Special Offers during checkout or call 888-755-7474 and be sure to mention promotion code "WITI". Enjoy! Employers: FREE Labor's Future Trends White Paper with any order. Hurry, offer ends December 31st! Job postings are available starting at only $250, but only for a limited time! More information. BEA Systems, Inc. is a world leader in enterprise infrastructure software, helping enable companies to improve business responsiveness through service-oriented architecture (SOA), a software design approach that more closely aligns IT with business objectives. BEA addresses the complexity of enterprise IT by delivering a unified development and integration platform for creating responsive enterprises to better meet the needs of customers, partners and employees. The BEA WebLogic Enterprise Platform™ is a superior framework for SOA that helps businesses efficiently leverage IT assets, speed the delivery of new services, and increase adaptability to ongoing change. Search for BEA jobs on WITI4Hire. Sr. Systems Administrator - Keane, Inc.
Keane, Inc. is hiring for our branch office in New York City. If you're a Sr. Systems Administrator, you'll be interested in reading about the exciting opportunities we are currently recruiting for in New York. As a Keane Sr. Systems Administrator, you will be responsible for providing 1st level support for various trading applications used by traders.